Giant king grass is a kind of excellent biomass material, which can produce about 18.4MJ energy per kilogram in pellets form. We can offer you giant king grass pellet plants with different capacity. 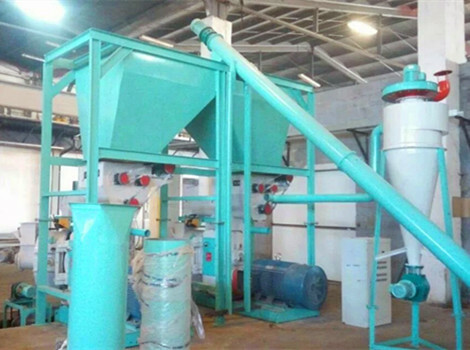 In this 3t/h complete giant king grass pellet production line, the main machines are chipper machine, rotary drum dryer, water drop hammer mill, two sets of ring die pellet mills, cooling machine and pellet packaging machine. The giant king grass is 3-5m in height, so you need the chipper machine to cut giant king grass into 20-40mm pieces. This chipper machine is made up of feeding hopper, cutter cover, knife, cutter blade, electric controlling device and engine base. It can crush various raw material, such as branch, cotton stalk, bamboo, limb etc. With large chipping capacity, the final chips length can be freely adjusted. This rotary drum dryer is the basic equipment in pellets production plant and is used to dry raw materials with high moisture. It consists of lifting blade, rotary body, sealing ring and transmission device etc. It uses hot air to reduce the moisture. When the raw materials are put into rotary drum dryer, the plates will raise up the material that will scatter down to move into a spiral forward. During this process, the raw material is fully contact with the hot air to achieve drying effect. Compared to other crushers, this hammer mill has more advantages. It is simple structure, low consumption and can crush more raw material, such as soft, hard, weakly corrosive material. Whereas, this hammer mill adopt advanced twice strike technology and the special design can improve working efficiency by 40%. After the raw material is put into the top of feeder, raw material are crushed under the force of adjustable rotating hammers and friction between screen plates, and finally the raw material will discharge by the push forced. 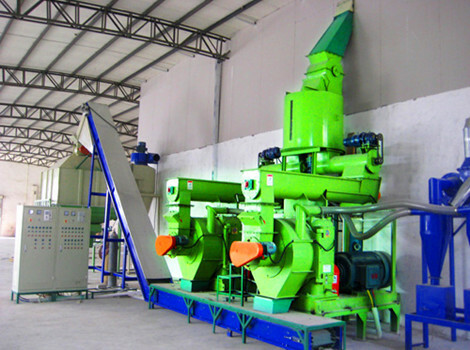 In this 3t/h giant king grass pellet production line, two sets of MZLH508 ring die pellet mills are disposed. The feed conditioner of ring die pellet mill adopts the frequency-conversion speed regulating control which ensure pellets quality. And the ring die with various bore diameters is stainless steel that can guarantee the pellet appearance and long service. As for international advanced compensation type snakelike spring coupling, it has the low fault rate, high safety and low noise. Through the conveyor, the raw material be delivered into ring die pellet machine and then enter into a rotating ring die by a feeder, and finally the raw material will be compressed through the holes in the ring die because of pressure. In order to make the giant king grass pellet convenient to store and transport, this cooler is mainly designed for reducing the raw material moisture & temperature and having a good cooling effect. It is made up of feeder, cooling room, outer drum and discharging room. When the pellets are put into cooler from the cooler top, the cold air will go through pellets vertically from the bottom to the top, and then warm air contact warm pellets which cools pellets gradually. This process can avoid pellets cracking. The packed giant king grass pellets are more convenient to transport or sold. A pellet packaging machine is needed. This machine is equipped with full digital intelligent weighing control instrument with high weighing accuracy, stable performance. On the other hand, this packaging machine use no weighing hopper structure, this can reduce the height and is convenient to install.